Appears in good condition, minor wear, a little fading. Not tested, do not know if it works. It needs to be adapted to a modern phone wall jack. Don't see an item you are looking for?. Fine Print. Condition is Used. It is in good condition considering age, has a switch off switch on cord. Cords/plug good. An "as is" sale. Not sure what this would have been used for. The Bakelite top does have a hairline crack. There is chip on the rim. The only marking on is on the top…. See all pictures for details. That is NOT a sticker! The sign is printed on ONE SIDE only. The sign has 2 holes for mounting (see photo). The image of the sign that you see is a. photo of the actual sign. THE PHONE WORKS AND RINGS STRONG. IN VERY GOOD CONDITION AND CLEANED INSIDE AND OUT AND FULLY TESTED. THE PLASTIC WAS BUFFED AND IS PERFECT THERE IS ONLY A SMALL BIT OF YELLOWING WITH THE NUMBER DIAL PLATE. Serial # B 507395 - Western Electric. 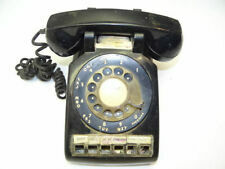 Offering a Vintage Bell System Western Electric Rotary Desk Phone. Black Model: CD 500. In decent condition with normal wear for age. This worked when it was retired from use but selling as untested. The cord end is not a plug end but wired in to the tan phone jack seen in photos. 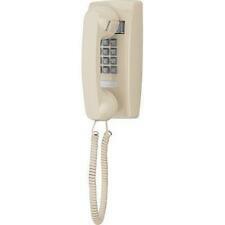 THIS IS A WESTERN ELECTRIC BEIGE WALL MOUNT ROTARY DIAL, GOOD SHAPE. Vintage beige Bell System Western Electric rotary phone in working condition. It has been plugged in and is working. There is a light attachment that lights up when the phone is ringing. Since this is attached, the ringer is silent. Scratches and stains, but a great display piece for home decor or use. The cord has some black sticky substance on it. Please refer to pictures for a more accurate description and feel free to ask questions or provide comments. Payment is expected within two days of sale unless buyer contacts me to set up an extension. Please also look at my other items on eBay. Vintage Camo Green Northern Electric Rotary Dial Telephone Nice Condition. Condition is Used. Northern Electric brand is a little harder to find as they were made in Canada. Phone is in good shape but is untested. Nice camo green color. Payment due within 3 days of purchase. Thanks for looking! New ListingWestern Electric Wood Subset Box Model 311A. It has been cleaned. This is a "WESTERN ELECTRIC" wood box that. Nice box with good label. Bag is VERY HEAVY duty canvas. Great quality. It was made just before Bell System breakup. (1970’s or later). Used for tools, hardware and other work related tasks. Dimensions of bag: 18 in. X 16 in. X 8 in. This bag is very rugged and will hold quite a bit of. The pics are accurate of what item is. It is soiled but in very good to excellent condition with no holes rips or tears. Handles are in excellent condition and riveting is all in tact. I don’t think it was used for a long time. I had a bunch of these and sell on condition. THIS IS A automatic ELECTRIC IVORY WALL MOUNT ROTARY DIAL, GOOD SHAPE BUT IS DISCOLORED FROM BEING IN STORAGE. Cord is in near perfcet condition. The burnt Red color is original Hard to find desk pone. Does not include 2 keys, only 1 Key. The larger Snoopy Phone has a moveable head that turns as pictured. Vintage NORTHERN TELECOM Alexander Graham ORANGE AIRPLANE Rotary TELEPHONE . Condition is Used. Shipped with USPS Priority Mail. Nice condition. No breaks or repairs. Tested and works. No phone jack. Some surface wear and light scratching but still displays well. Could use a good cleaning but I will wipe down before shipping. It has been repainted in Satin Black. It has a standard/original 3 lead cord. The #1 on the dial is a little faded but the remaining numbers are crisp. The dial appears to have 5H on the back. The brass regulator on the dial has a 5 and possibly an 8 of B in red. I have the original cloth cord that would send power to the phone, and I will include that with the phone, you will need to wire it to inside of base. DO NOT DUPLICATE OR COPY! Good working condition. The cord is stretched out. Good-faith effort has been made to properly display/represent conditions and content of sale. THE PHONE IS USED AND HAS SIGNS OF WEAR. THERE IS A SMALL CRACK AND SLIGHT DISCOLORATION THAT CAN BE SEEN IN THE CLOSE UP. This is an older phone and I do not have a way to test it, so it is being sold as is. Vintage Western Electric Model 302 Telephone. Condition is Used. Shipped with USPS Priority Mail. 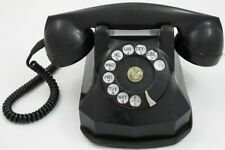 Restored vintage Western Electric 302 black telephone, with F1 handset and #6 dial. Circa 1946. Very clean and in good condition with number card, leather feet, and appropriate straight line handset cord. A modular mounting cord has been installed and can be plugged into today's modern phone jack. The housing and the F1 Bakelite handset were cleaned and buffed to reflect the original appearance. The dial has been independently tested, lubricated, and calibrated. 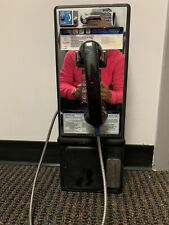 This telephone has been tested and is ready for display/use, but the buyer may want to contact their dial tone provider to confirm the acceptance of rotaty dialing. This is a nice black 6-button 2563 1A2 phone with handset jack on the rear side. It has been rebuilt, is very clean, has been tested and is a functioning phone. This phone will work with most 1A2 systems. We promise all products are totally genuine! I AM NOT AN EXPERT. THERE ARE NO WIRES CONNECTING THE HANDSET TO THE BASE. I AM NOT THE ORIGINAL OWNER THEREFORE I DO NOT KNOW IF THE HANDSET IS ORIGINAL TO THE BASE. Good working condition. I haven't tried so I don't know if it can be removed while saving the finish. Otherwise condition is good with minimal signs of wear. Includes original box and Styrofoam cradle to protect the phone. Interior: Inside, the five bar magneto is unmarked and rings at the turn of the crank. Both the switch hook and the ringer are unmarked. There are no batteries in the box. Receiver & Transmitter: The receiver is old and unmarked; there is a hairline crack in the shell. There is no part or model number. It is sort of olive green in color. Maybe it was part of a military headset or portable field phone?. This hard covered catalog is undated but may be from 1911 based on printer code on front page. 9 1/2" x 6 1/2". 332 pages and there may be a page or two index pages missing. Page 332 is loose. Pages are tight to the binding, but binding semi-detached from the hard covers. Well worn and well used but complete with no noticeable damage except for usage and wear. These catalogs are very scarce. Thank you for looking. Vintage western electric Push Button Panel Phone - Copper color. It is in good used condition - UNTESTED. Comes with mounting bracket. Does NOT include the plastic trim piece.... sorry. No visible wires in back. The dial will turn but springs back slowly. There is a small crack in clear dial. Condition is Used. The extension gate moves smoothly. It is marked - Western Electric Made in U.S.A. on one side. Nice shape. Nice piece. Not a lot of rust to talk about, but a little. Normal wear. IT IS ACTUALLY A LITTLE DARKER THAN THE PICTURE INDICATES. UNDER THE DIAL THERE MAY BE A SMALL PIECE MISSING. This phone is very unique on many levels. Clean and sanitized. Excellent collectible piece and working. Phone has an old style plug, so you may need to buy a cord to fit the modern wall outlet. A line cord with a modular plug allows you to plug it into your wall outlet and start using it. The interior parts of the phone are Western Electric. This phone rings, and makes and receives calls with nice sound quality. Not sure if it is from before the 1930's or a modern reproduction. 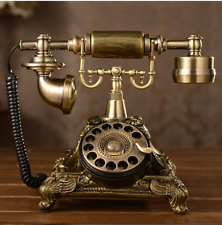 This attractive phone is Yellow or Harvest Gold in color, and of course the old rotary dial with phone number window in the center. Dial rotates as it should. We don't have a way test it, most likely it still works fine but must be sold as-is and untested. We promise to resolve problems quickly and professionally . The center provides for the physical necessities, as well as focusing on the participants emotional and spiritual needs. The physical and spiritual care the program participants. 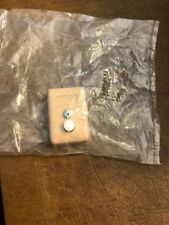 This item is an unmarked Stromberg-Carlson ringer box with mounting holes. Overall, the wood is in fair condition, and the finish is also fair. Interior: Inside is a 5 bar unmarked magneto that rings the bells at the turn of the crank. Vintage Desk Phone Rotary -L@@k!